Your inquiry has been forwarded to Sims Funeral Services. 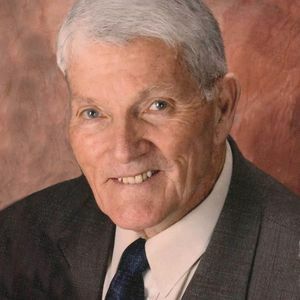 George T. Hendrix, age 83, Harrodsburg, husband of Sue Large Hendrix, died Sunday, September 22, 2013 at his residence. Born March 30, 1930 in Big Rock, KY (Leslie Co.), he was the son of the late Dan F. and Joanna (Caudill) Hendrix. He served during the Korean War with the U.S. Air Force, was a Signet Systems and Eaton Corporation employee, a farmer, a member of Gideons International, a former Mason at the Cornishville Masonic Lodge, and a member and Deacon of the Cornishville Baptist Church. Survivors other than his wife include: three daughters: Patti (Steve) Harmon-Stewart and Debby (Charlie) Ballard both of Harrodsburg, KY and Brenda Babinec, MI; one son, Stewart (Laura) Hendrix, Frankfort; two brothers, William Hendrix and Larry Hendrix both of Harrodsburg; eight grandchildren, Brandon Harmon, Wesley Harmon, Kipp Ballard, Beth Elliott, Sarah Ballard, Madeleine Hendrix, Sydney Hendrix, Cooper Hendrix, Ben, Brice and Beth Babinec, MI; eight great grandchildren. He was preceded in death by two brothers: L.K. Hendrix and Dan F. Hendrix, Jr. and one sister, Juanita Day. Funeral services will be conducted 11:00 am, Wednesday, September 25, 2013 at Sims Funeral Services by Bro. Mark King, Bro. Paul Readnour and Tim Day. Burial will be in the Springhill Cemetery. Pallbearers are: Brandon Harmon, Wesley Harmon, Kipp Ballard, Cooper Hendrix, William Hendrix, Larry Hendrix, and Jerry Bartel. Honorary bearers are: Deacons of the Cornishville Baptist Church, Clayton Tyler, Bill Grimes and Shirley Turner. Visitation will be Tuesday, September 24, 2013 from 5:00 pm until 8:00 pm and Wednesday from 7:00 am until the hour of service at Sims Funeral Services. Memorial contributions may be sent to Gideons International or Cornishville Baptist Church Building Fund, 989 Mann's Road, Harrodsburg, KY. I will always remember our trips down to visit you & Sue. I hold those memories deep in my heart. I was always so excited to see my daddy. I remember you coming in where I was sleeping and waking me up to give me a big hug and greeting. I remember eating frozen strawberries that grandma had frozen, and chasing tadpoles in their little cement pond or whatever it was. I can smell the biscuits that Aunt Juanita was baking in her kitchen and see her preparing this huge spread of food for her growing family. :) I can see the swinging bridge that was over the river that would take us to her house and playing in the water. I have visions of so many wonderful times. We may not have been close but in my heart you were always with me. I am grateful for the life & love that you and Sue had and for your faith. I remember playing with the girls on visits too. Playing in the hollers always a creek near by. My faith in Christ is strong and I will be reunited with you and grandma & papa and all the family for a big reunion. Peace & Love to all of you. May God be with yo as you move forward in your lives but keeping dads memories alive in you. I miss you so much already. You were the best grandpa that anyone could ever ask for. I'll miss hearing your voice and being greeted by your smile when we would visit. Love you and miss you. I remember Uncle George's voice being so soothing, his smile so genuine, and his handsome face. I remember how happy mamaw was when her brother George would call or visit. I remember how happy Aunt Sue and Uncle George were and seemed so in love after so many years. Love and miss you, but I know I will see you again. We will miss you so much! You were such a blessing in our lives and I am very thankful for all the years I had you in my life. You were a great person and the best grandpa!! You taught me so much and always had a smile on your face and an encouraging word. I will miss seeing you and getting to talk to you, but I look forward to seeing you again in Heaven one day! We love you and miss you!! Its always hard to give up the ones we love and its especially hard when they are as special as George. We are so sorry for your loss but we can all look forward to the day when we can meet him again. We will all keep the good memories we have of the years we were blessed to have him. Our thoughts ,prayers and love are with each of you. God be with you in your time of grief. So sorry to learn of your Dad's passing. Prayers to you and yours for comfort and healing.